Arkansas motorists will pay 3 cents more for a gallon of gasoline and 6 cents more for diesel after Gov. 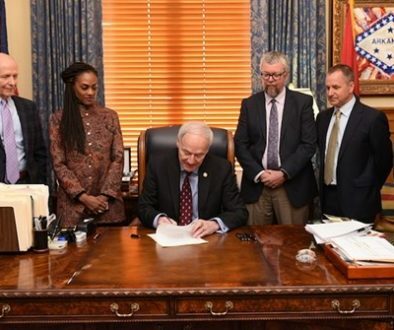 Asa Hutchinson signed part of what he called “the largest highway plan in the state’s history” into law Tuesday (March 12). Act 416 by Sen. Terry Rice, R-Waldron, will raise $95 million annually for the state’s highway system. Of that, $58 million will come from the fuel tax increases. Those taxes then can increase by a maximum of one-tenth of one cent per year. The bill will increase gasoline taxes to 24.5 cents per gallon and diesel taxes to 28.5 cents per gallon. The bill also will raise a minimum of $35 million from new casino tax revenues, restricted reserve funds and other general revenue sources. Voters passed a constitutional amendment in November allowing four casinos to operate in Arkansas. Finally, it will raise almost $2 million by imposing additional fees on users of hybrid and electric vehicles. 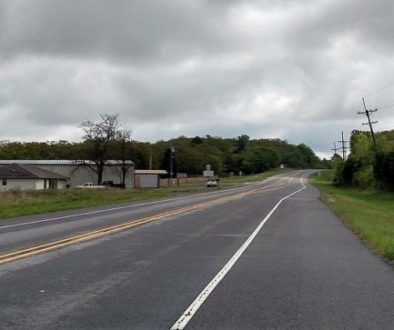 The tax increases are part of the governor’s $300 million highway program that also includes a constitutional amendment that will be on the ballot in November 2020. Voters will be asked to permanently extend a half percent sales tax that expires in 2023. Voters approved that tax in 2012. Hutchinson held up a copy of that resolution after signing the bill, but was not required by law to sign it. Act 416 and the constitutional amendment together also would raise $110 million annually for cities and counties. 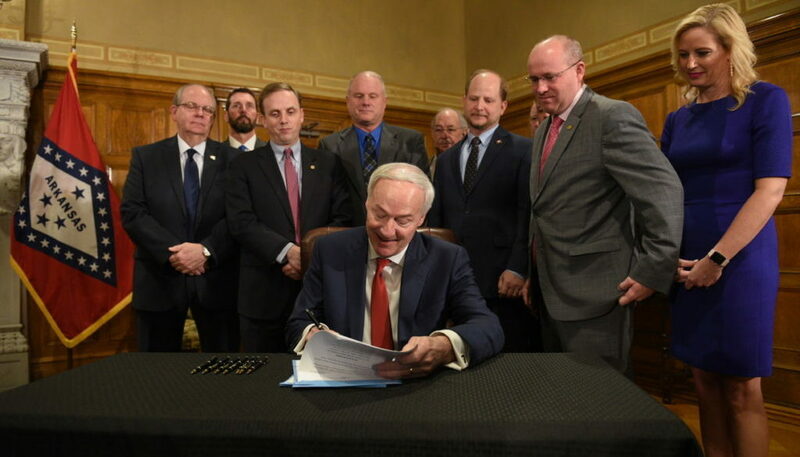 Hutchinson called Tuesday’s bill signing “historic.” He called it a balanced plan with new revenue sources, funding coming from existing general revenues, and a request for voters to approve the half percent sales tax extension. Act 416 passed with 25 votes in the Senate on its final vote and 71 votes in the House, including both Republicans and Democrats. The constitutional amendment passed with 67 votes in the House and 25 in the Senate. The biggest challenge was coalescing support behind a single plan, he said. Hutchinson also signed two other bills which he said helped create support for the highway plan. 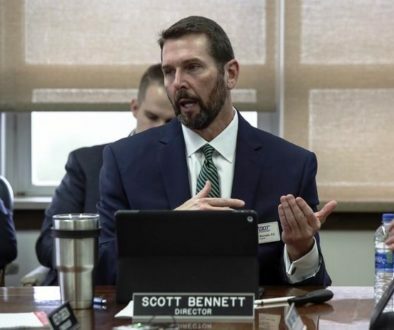 Act 298 by Sen. Jonathan Dismang, R-Searcy, enables the Legislature to hire one or more consultants to study the Arkansas Department of Transportation’s processes and functioning. It also creates an annual study of the department. Act 299 by Dismang requires ARDOT’s director to present the department’s draft legislation to the Highway Commission by Dec. 1 of each year prior to a regular legislative session.